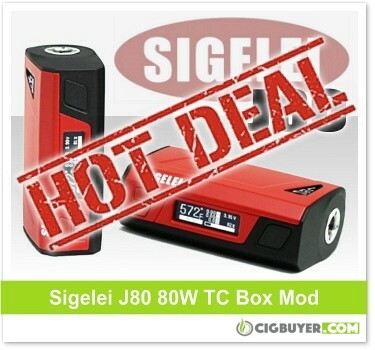 Sigelei J80 80W 2000mAh Box Mod – ONLY $18.00!!! Originally retailing for over $50, if you’re looking for a compact sub-100W device with large built-in battery, you won’t beat this deal from Ecig-City. While supplies last you can get the Sigelei J80 80W Box Mod for only $18.00! Providing up to 80W of output with full temperature control and a long-lasting 2000mAh Li-polymer battery, it’s super compact and has a great looking 2-tone design with multi-line OLED display, diamond-shaped firing button and micro-USB charging port. The Sigelei J80 Mod includes a variety of built-in safety features, MCU protection and is compatible with standard, Ni200, Ti and SS316 coils.